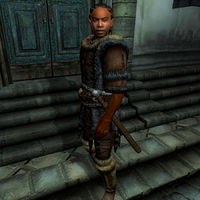 While awake, Rhano wears a fur cuirass, greaves and boots; however once the night arrives he switches to his second outift, which consists of a set of lower class clothing. He is armed with an iron shortsword and also carries a medium-sized amount of gold. Esta página foi modificada pela última vez à(s) 21h58min de 27 de dezembro de 2012.